AKIPRESS.COM - Political consultations between the Ministries of Foreign Affairs of Turkmenistan and Turkey were held in Ankara. Turkmen delegation was led by Deputy Minister of Foreign Affairs of Turkmenistan,e delegation of Turkey was led by the Chief of Directorate of bilateral political relations of the Ministry of Foreign Affairs of Turkey Ambassador Yonet Can Tezel. The talks focused on bilateral political, trade-economic and cultural-humanitarian relations. The parties also discussed possibility of holding the next meeting of Turkmen-Turkish Intergovernmental Committee on economic cooperation. 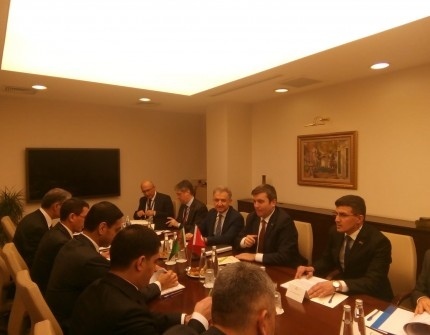 In the second half of the day, the Turkmen delegation met with the Deputy Minister of Foreign Affairs of the Republic of Turkey Mr. Yavuz Selim Kiran. The parties analyzed the state of mutually beneficial cooperation between the two countries in different spheres. The Turkmen side has stressed its readiness to further strengthen and widen these relations based on the principles of equality. The Turkish side has also noted that it attaches great importance to further development of friendly and brotherly relations in all the areas. In the framework of the visit, the issues concerning mutual trips of the citizens of Turkmenistan and the Republic of Turkey were discussed in detail.